Redesigned for maximum breathability, minimal weight, and superior traction, Altama's new Foxhound series takes incorporates design improvements from its older Exospeed and Exospeed II series in developing an even better boot. The Altama 365803 features a lightweight profile built for speed and agility and is ideal for missions that require stealth and balance. It features top quality suede leather and abrasion resistant nylon cordura treated with with Scotchgard stain resistance to keep a uniform appearance. A lightweight EVA midsole is light and attenuates shock when running or jumping. Comfort features include a moisture-wicking air mesh lining with AEGIS antimicrobial protection to keep your feet dry and cool during the duty day. This boot is 100% non-metallic and ideal for environments where x-ray equipment is present. 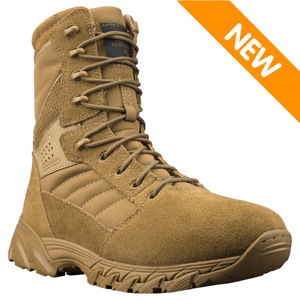 This boot is AR670-1 approved for U.S. Army uniform wear and was meets uniform specifications for the OCP ACU. I've been a big fan of Altama since I was in the military in the 1980s when the jungle boot was the best. It's a shame they discontinued all their older models. I thought I'd try one of these newer gen models and I have to say I'm pretty impressed. This coyote model I bought is and is well made. It has double stitching in the toe and heel. They are very comfortable and extremely lightweight. Another thing is the ankle support is at a good level between being too stiff and not offering enough support. These are just right. It's been 2 months so far and I'm very happy with these boots. In short, these are a great garrison or light patrol boot. I've been wearing these going on 4 months in Afghanistan (mainly convoy duty) and these boots have been great. I've put quite a few miles on them here and my feet stay cool and believe me it gets hot here. I haven't never gotten a blister yet. However If I could improve on one area of the boot. The area above the heel where the suede meets the fabric is prone to rubbing at the Achilles heel area especially if you are going down a decline. These boots never gave me a blister, but did eat through a few pairs of socks over a few months. Other than that, they are great. Lightweight, decent boot to wear after more demanding ruck marches. They're not boots I would wear in a field or operational setting.